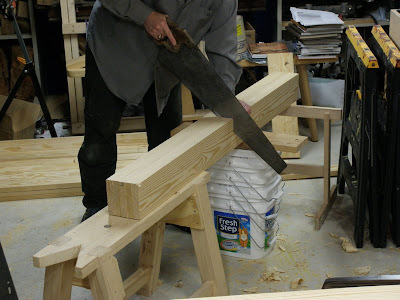 Cutting the leg timbers in half. I knew I was keeping all those empty kitty litter containers around for something! A stack of them made a fine cutoff support. Gang chamfering the foot end of the legs. 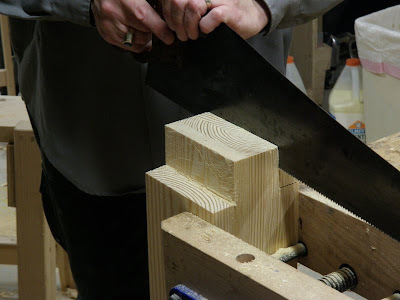 First method for sawing out the timber-frame-sized tenon cheeks at the top end of the legs. Second method, since they were short enough. This turned out to be easier, better angle to see the saw exit so I didn't over-cut. All four legs sized and tenoned, along with the slot in the foot of the leg that will be front left. This is for the leg vise. German bench screw is on order from Woodcraft. Plowing the groove in the underside of the top for the sliding deadman using a Stanley 45. First time I've used it, so I sharpened up the plow blade with Mike Dunbar's "scary sharp/sensible sharpening" sandpaper system. A brief digression: Sharpening is a big barrier for people trying to use hand tools; it was for me. It looks time-consuming and troublesome, bringing work to a halt. Dunbar calls it a gateway skill, opening up the hand-tool arena, because hand tools need to be really sharp to be usable. His system just works, no jigs, no messing around, 5-10 minutes to take a tool from flea market condition to razor sharp. Like any hand-tool skill, it takes a little practice, but not much, and you're back to doing what you want to do, working the wood. To get set up, I ordered one roll each of PSA sandpaper in 80, 120, and 320 grits, and several 5-sheet packs each of wet-dry sandpaper in 600, 1000, and 1500 grits from Klingspor. I found tempered plate glass shelf pieces at Home Depot in the shelving section, a 36" piece for my dedicated sharpening station, and a 24" piece for carrying in a yet-to-be-built tool chest. Mike's original video used a 36" glass plate; in later articles he switched to aluminum plates due to the risk of breakage; I've seen people mention using MDF, Corian, and marble, as long as it's flat and stable. The 45 did a great job, except that the skate left several inches undone at each end, and it bottomed out about 1/8" short of the required 1" depth. 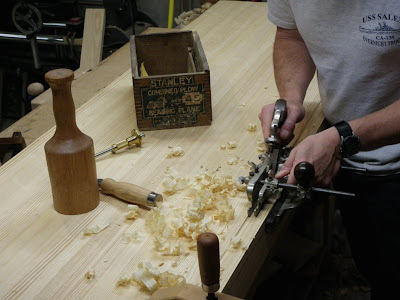 So I brought out the chisels and the number 71 router plane, extending its cutter past the normal depth adjustment. It was a little chattery, but worked quite well. Final chopping at the ends. I didn't have a 5/8" mortising chisel, so I made do with a 3/8". Why so hung up on the one inch depth for the slot? Close counts in horseshoes, hand grenades, AND wood working. Mainly because the design called for 1", and at this point it wasn't clear just how precise I had to be. I didn't want the deadman to be catching or jamming up as I slid it, or have trouble going in. I didn't laminate the tenons because I couldn't find the right thickness stock. My legs are laminated from 5 boards, where Chris used 4. My stretchers are 3, where he used 2. Cutting the tenons actually turned out to be a pretty simple operation. 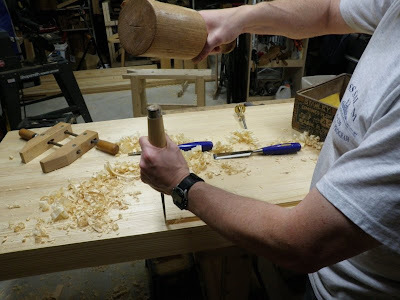 Making the mortises was much more work. Makes perfect sense now. Thanks for the follow up. I will probably have a lot of questions for you this winter as I embark, and also aim to use hand tools as much as possible. I'm not opposed to using a router for the deadman groove, I just don't have one! I'm going to use a powered planer but try to do the jointing by hand (don't have a power jointer). What do you consider a medium sized handsaw? The only saw I happen to own is a panel saw. I don't think the saw plate is capable of cutting through a huge 5X5 leg. I'm afraid the saw plate might overheat and warp. 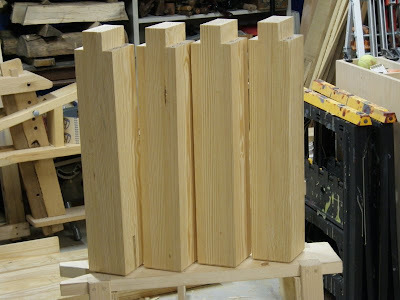 I am getting ready to build a Roubo bench but I am wondering how I am going to cut the legs and the end of the bench square. I was thinking of ordering a big 16 or 18" backsaw from Bad Axe Tools to get the job done but I think I'd rather a handsaw. Am I better off investing in a 24-26" handsaw (cross cut)? Yes, I highly recommend a full-size crosscut saw for big cuts like that. I don't think you would have a problem with a smaller saw overheating and warping, but the long saw will allow you to take long arm strokes. I used a 26" 8 TPI saw; I also have a 24" 7 TPI saw. 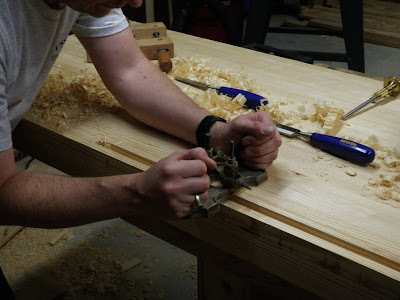 With a backsaw, the back would probably interfere in such a large cut (unless its plate was deep enough to saw straight across the full depth of the cut). To pick a good handsaw size, stand with the saw held by its grip hanging down. If it just touches the ground or is shorter, the length should be fine. 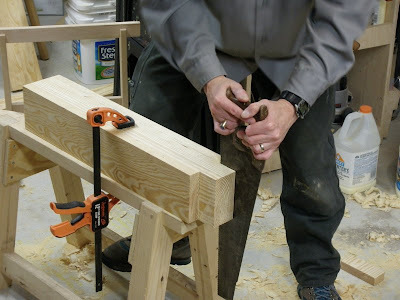 Longer, and you may start hitting the floor when using it on a knee-high saw bench. 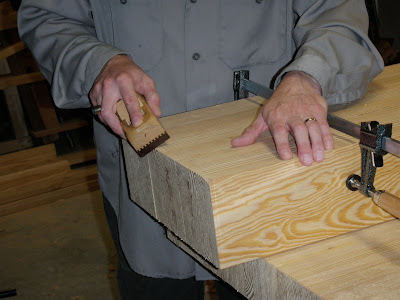 Another reasonable way to measure is to stand with your arm at your side and cradle the toe of the saw in the first knuckles of your hand with the saw lying up along your arm. If the heel of the plate comes up past your shoulder, it's probably too long. Pick the longest saw within these guidelines as your main worker. The most efficient sawing comes when you can take good long strokes without running into anything.